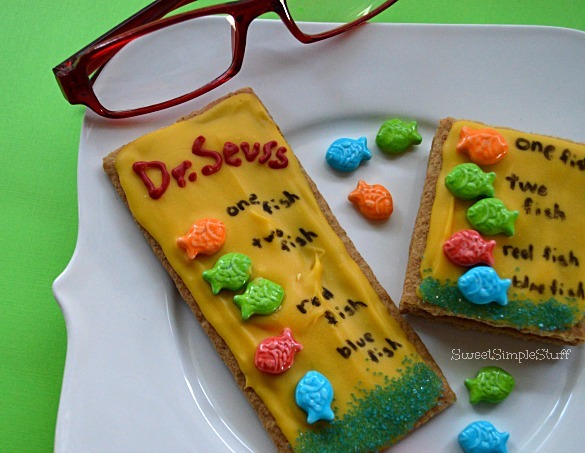 March 2, 2015 … Dr. Seuss Day or Read Across America Day, would have been Dr. Seuss’s 111th birthday! I remember reading Dr. Seuss books as a child and loving them … continued that tradition by reading them to my kiddos. We even made green eggs and ham, by adding blue food coloring to eggs while scrambling them. 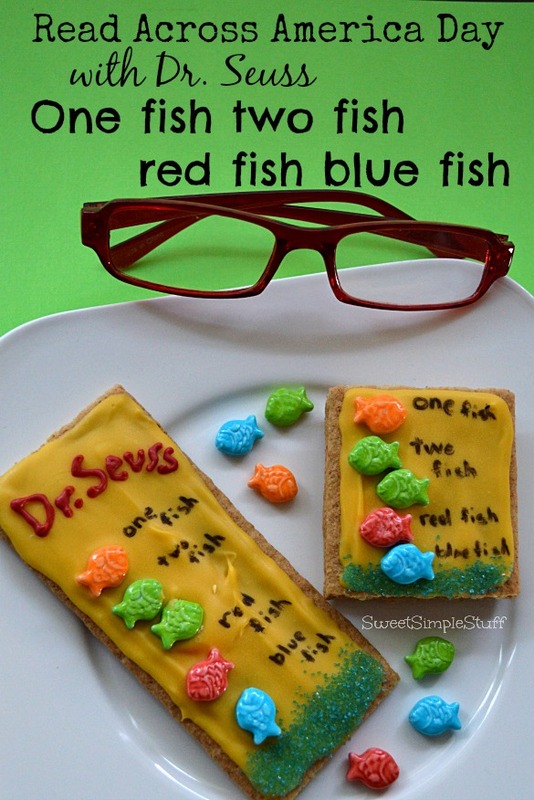 Today, I am honoring one of our favorite books … made some very Easy Dr. Seuss Cookies … One Fish Two Fish Red Fish Blue Fish! Can you see the white inside the cookie book sandwich? It reminds me of pages of paper between the graham cracker covers. Books are a very special thing to me … very opinionated in this matter … ebooks are great, but real books that you hold in your hands are irreplaceable. These cookies are so easy … no baking required … graham crackers to the rescue! I used melted candy coating because it hardens quickly. If you decide to use royal icing, allow more time for drying. 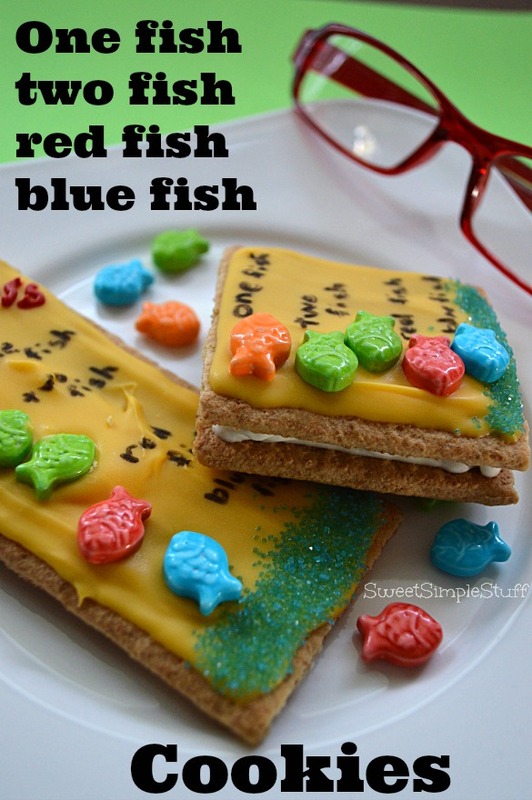 Colorful fish candies worked perfectly! 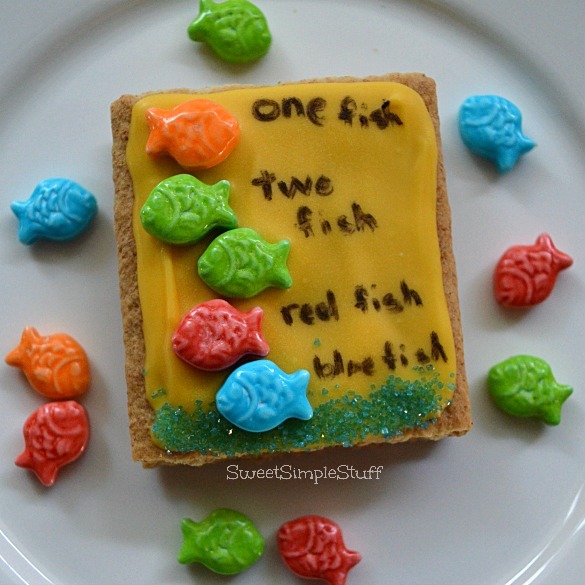 To make the book cover – Use a whole rectangular graham cracker, spread melted yellow candy (I used the back of a teaspoon) on one side of cracker. 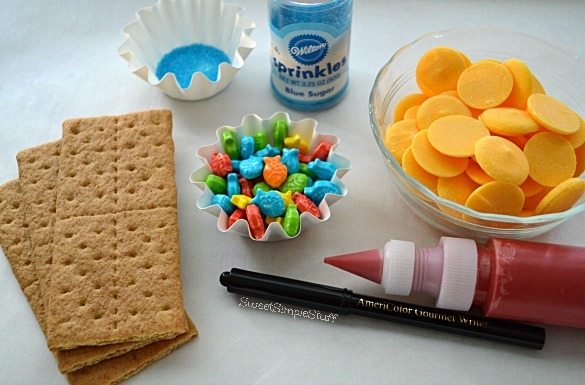 While the candy is still soft, put fish candy in place and sprinkle some blue sugar along the bottom edge (as the water). Chill for a few minutes (do not leave in the refrigerator too long, to avoid moisture build up). Use melted red candy to write “Dr. 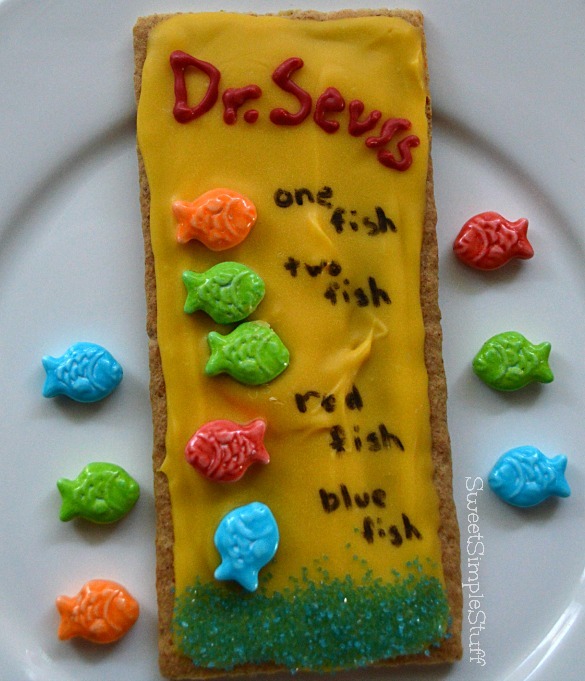 Seuss” along top of cookie and black marker to write ” one fish ….”. Hint: a coating sometimes builds up on the tip of edible markers, gently wipe it on a paper towel and continue! 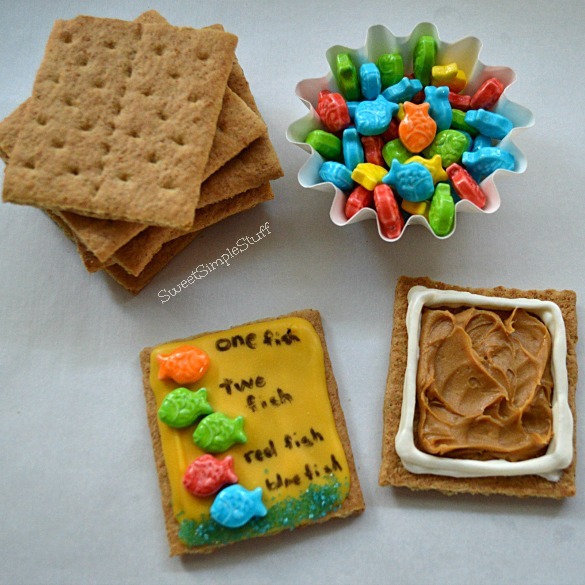 To make mini cookie book – Cut graham crackers in half (use a serrated knife and sawing motion). 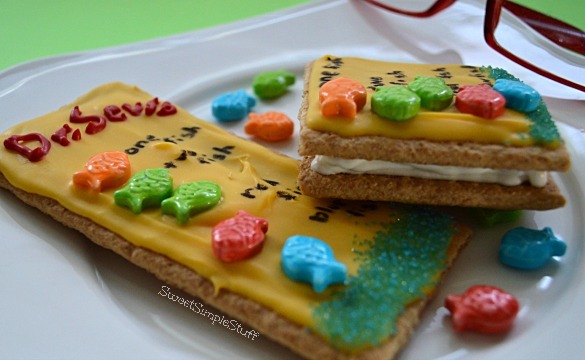 Each book will use two graham cracker squares … one decorated top and a plain one for the bottom. To make the top … follow directions above (omitting the use of red candy). 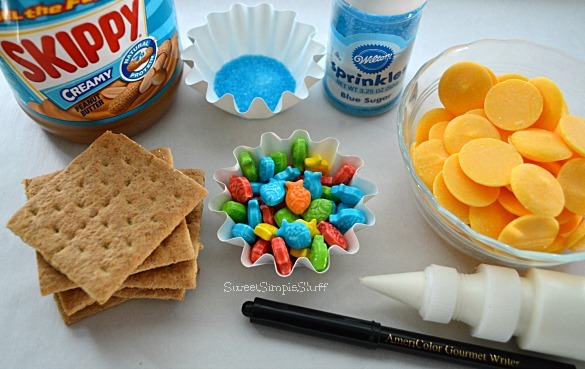 To make the bottom … spread some peanut butter on a graham cracker, leaving enough room to pipe white candy around edges. Pipe white candy, let it set until it has started to firm up, add another layer of white candy and a third layer if necessary (this will create a “dam” for the peanut butter, create layers of “pages” and hold the top and bottom cookies together). Place top “book cover” on bottom and chill for a few minutes. Absolutely adorable. If I had little guys, what a perfect treat to bring into to school for a treat! Sharing, of course!